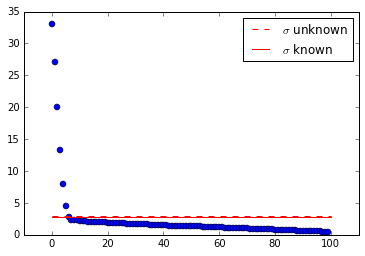 Rank-reduction is a very common task in many SVD-based methods and algorithms. It is the technique by which a high-dimensional, noisy data set can be reduced to a low-dimensional, clean(er) data set. Under ideal circumstances, an “in-the-loop” human expert will perform the rank-reduction according to their own judgment. Unfortunately, expert knowledge is often unavailable for automated methods and algorithms. This post demonstrates a principled approach for performing the reduction auto-magically – without any need for expert, “in-the-loop” knowledge! One of the first steps after SVD-ing your data matrix is to take a quick look that the singular values in $\Sigma$. Usually, the “look and feel” of the singular values will tell you something about the ideal dimensionality, or rank, of the data. Once you decide on a new rank, r, you can truncate the $U\Sigma V^*$ matrices accordingly to simplify the system. There are many techniques out there that attempt to automate the determination of r. One such technique is the Optimal Singular Value Hard Threshold (optimal SVHT) developed by Gavish and Donoho (2014) 12. Here I’ve extracted the key ideas from their article and recast them in a Python context. Let’s start off by building a test data matrix that we know contains some structure and some noise. Arbitrarily, we choose the x-axis to represent a single spatial dimension and the y-axis to represent time. The axes could represent anything though – the SVD will handle any 2D matrix. If you study the code, you’ll notice that the data contains two modes and a small amount of normally distributed noise, with $\sigma=1/2$. 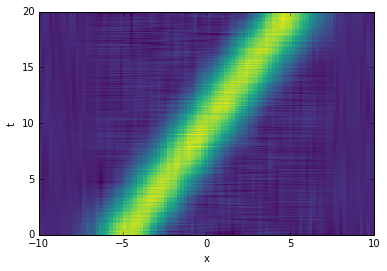 When plotting the singular values of $D$, one would expect to see two large, well-separated singular values with the remainder being much smaller and tapering off towards zero (as we shall see, that is exactly what happens). The rank should be $r=2$. The optimal SVHT, $\tau_*$, tells us approximately where to truncate the singular values so that only “important” modes remain. The calculation of $\tau_*$ falls into one of two general scenarios: where the noise level $\sigma$ is known or unknown. I would assume that $\sigma$ is unknown in most cases of interest, so we’ll start with that. The quantity $\lambda_*(\beta)$ shall be explained shortly. For now, let’s SVD the data matrix and compute $\tau_*$. """Return an approximate omega value for given beta. Equation (5) from Gavish 2014.""" 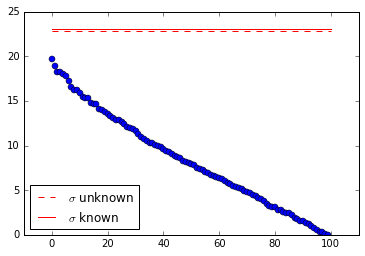 In the plot of singular values above, the red line indicates $\tau_*$. Notice how it conveniently separates the true modes from the garbage. Now that we have the optimal SVHT, we can truncate the SVD and reconstruct the data. The new data matrix will be the same as before, but de-noised! The following code calculates $\tau_*$ for $D$ with $\sigma=1/2$. """Return lambda star for given beta. Equation (11) from Gavish 2014.""" I wrote the following method to conveniently handle the computation of $\tau_*$ for most use cases. Just copy and paste it, including the imports from before. """Return the optimal singular value hard threshold (SVHT) value. The first example matrix contained clear structure. Let’s test the strategy for a completely random matrix. We see that the optimal SVHT tells us to truncate everything! It happens sometimes that a data set is low-dimensional, but its SVD suggests high-dimensionality. Translational invariance is one such case. 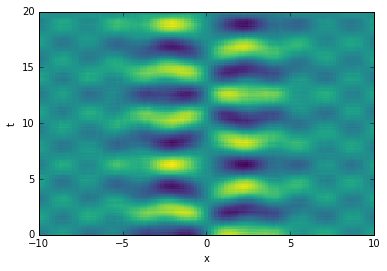 Let’s see how the optimal SVHT holds up to weird data like this. The following data matrix contains a single mode (a Gaussian) moving diagonally through space and time. Sadly, the SVD is not able to isolate the single mode. It identifies many modes instead. The cool thing is that (at least in this case) the optimal SVHT is still useful! 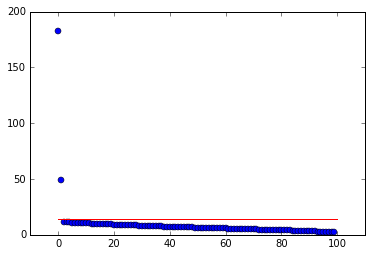 The truncation thresholds shown in the singular value plot below are intuitive. Truncate the SVD and reconstruct the data with fewer dimensions to produce a cleaner image. Even though the SVD fails to pick up the single mode, the SVHT still recommends a sensible rank for row-reduction.